The minute Nicholas Cove and Trevor Kiscadden met, they knew their future in music was a journey meant to be shared. The stars finally aligned when Cove moved from Catawissa, PA to Annville to attend college. After meeting Jamey McElroy and coming together with him and Kiscadden for a jam session, the vibes of the three-piece were strong. It was McElroy who starting mashing words together, trying to create a band name unique to them. “Para”, the Greek word for beside or side-by-side, and “Drei”, German for three, only seemed fitting. Just three dudes, side-by-side for a hell of a journey. Paradrei began almost immediately. It wasn’t their first painting, but their first album The Black The Sun EP shares a similar metaphor. Despite it not turning out the way they intended, it paved their way from one opportunity to the next. That next opportunity was Seventh Wave Studios. Seventh Wave Studios was where the In Threes EP was created, an acoustic take on some of their previous music. “It brought a hint of the vibe that we were going for but it wasn’t exactly what we wanted because it was acoustic,” Cove said. Their first full-length, DEEP|ALIVE, was also recorded at Seventh Wave and is exactly what they were looking for as far as introducing themselves to the public eye. Each band member contributed to the album, creating lyrics and a sound that summarized the two years it took them to compile the content. 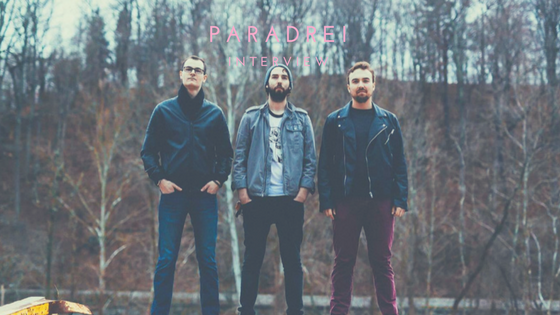 With DEEP|ALIVE as their driving force, Paradrei steps into the next big transitional period for the band and continues to build onto what they’ve started. Just three dudes, side-by-side for a hell of a journey.